From the Hancock County Courthouse, go west on Hwy 22 for 0.2 mile. Turn right on Dixie Road. Go 1 mile. Turn left on Lake Shore Road (old Pumping Station Road) and proceed 7.8 miles to the "T" intersection with Warren Chapel Road. (Note: this "T" intersection with Pumping Station/Lake Shore Road has Warren Chapel Road to the left and Harper Cemetery Road / Rives Rd. / Crestline Dr. to the right). Turn right on old Harper Cemetery Road and go 0.7 mile. Turn right under the power line onto Rives Road (unmarked dirt road), and go less than 0.1 mile to power pole 92-59-003 on the right. Go up the bank on the right. The cemetery is ahead of you (east) and about 100 feet from the road. 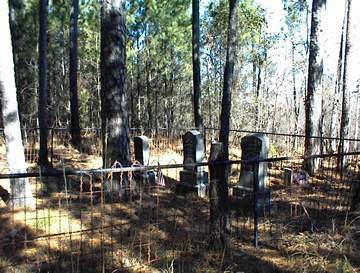 A rusty wire fence is around the cemetery. Site of the Antioch Methodist Church, which burned long ago (no date). s/o B. I. & M. H. Harper. "We can safely leave our boy, Our darling in Thy Trust." "To Him, we trust, a place is given. Among the saints with Christ in heaven." w/o B. I. Harper. "Dearest Mother, thou hast left us, Here thy loss we deeply feel, But 'tis God that bereft us. He can all our sorrows heal."